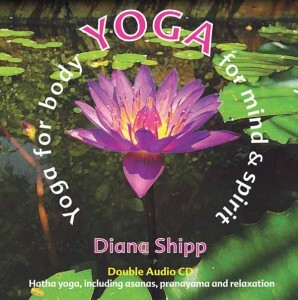 Enjoy your home yoga practice, with this double audio CD set, which includes yoga postures, breathing and relaxation. Motivate yourself and feel really good as you follow Diana’s calm and reassuring voice and clear instructions. This practice is suitable for any time of day and Diana’s students will recognise it as the morning practice from her holidays in India and Europe, based on the classical Sivananda system. Includes booklet with clearly-drawn stick people to help you. We suggest a 35-minute relaxation sequence – perfect after a long day – and a 50-minute sequence that will leave you feeling refreshed and full of energy. I have never done yoga before – I am now a convert!